Nintendo Australia today announced the release two new 3DS models in Australia, the New Nintendo 3DS and the New Nintendo 3DS XL. The announcement was made on YouTube via the first ever Nintendo Direct Australia, posted by Nintendo Australia and embedded above. Nintendo Australia managing director Tom Enoki revealed that both handheld consoles will be released in Australia on November 21 this year, just over a month after the Japanese release on October 11. The New Nintendo 3DS will be available in white at launch, and the New Nintendo 3DS XL will have two colour options, metallic black and metallic blue. 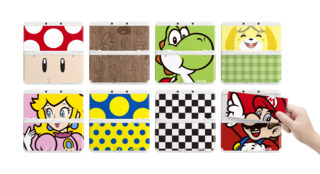 Cover plates will also be available, which players can purchase to customize the external design on the console. The New Nintendo 3DS and New Nintendo 3DS XL have recommended retail prices of A$ 219.95 and A$ 249.95 respectively. The consoles will not include an AC adapter, however, they will be compatible with all older model DS and 3DS adapters. The New Nintendo 3DS and New Nintendo 3DS XL will also integrate use with the Amiibo figures directly, negating the need to purchase a separate accessory. Amiibo compatibility will also be integrated with the upcoming Super Smash Bros. for 3DS. The New Nintendo 3DS devices were first announced in August this year at a Nintendo Direct presentation. The new models feature a stronger CPU than existing models, which should allow for zippier downloads and browsing from the eShop. They will also include an analogue “nub” over the existing A,B, X, and Y buttons. In addition, there are new shoulder buttons–ZR and ZL–featured on top of the system, right next to the current L and R buttons. Nintendo will be showcasing the consoles at the upcoming EB Expo, and they will be playable at PAX Australia this year. The GameSpot Australia team will be present at both shows, so be sure to stay tuned to the site for updates! Tagged America, Australia, Before, confirmed, Europe, Launch, Nintendo, November, This.